Yesterday’s announcement by Gilat and Intelsat General of tests on Gilat’s BR 71 antenna is great news! Really. Why would an X-band satellite operator say this? Because every technical advancement forces all players to aim at a higher performance threshold, so with this small terminal, one more barrier is being removed. The testing with this Gilat antenna also sheds light on some of the value statements from the HTS community that HTS satellites will bring greater capability to the market than legacy broadbeam satellites. While I think there are some other limitations, this testing goes a long way to proving that proposition. According to the press release, efficiency has improved from 0.09 bits/Hz to 0.26 bits/Hz – according to my math, an impressive 150% leap. In fact, this is good news for XTAR too. While Gilat is targeting the Ku-band market, we did our own testing – at X-band – on the same Gilat BR71 last year on XTAR-LANT, achieving impressive results of our own, namely: 0.64 bits/Hz on X-band – 2 ½ times better than Ku on High-Throughput Satellite (HTS). In addition to the tests with Gilat, we tested the 8-inch Ball Aerospace AIRLINK® X-1 terminal, and got even better results – 0.97 bits/Hz. The BR 71 is a 6 inch square flat array low profile antenna that could lead the way to using broadband satcom on ever smaller aerial platforms. 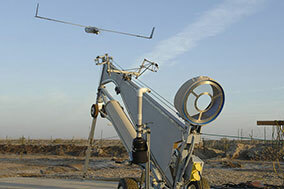 Small UAVs just don’t have the carrying capacity of their larger cousins, the Global Hawk and the Predator, so the satcom terminal size is meaningful. Throughput has been a limiting factor. Not so with the new Gilat and Ball Aerospace antennas. This clearly demonstrates that with small, mobile terminals typically required by users working with comms-on-the move or on-the-pause applications, X-band has significant technical advantages compared with Ku-band – even HTS Ku-band. 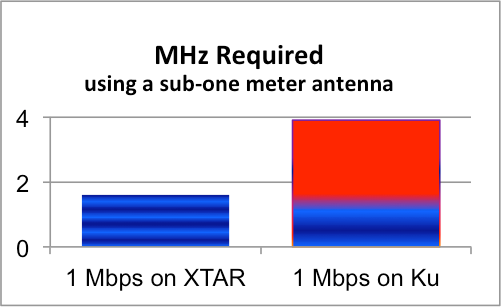 X-band clearly sets a very high performance bar in high throughput, sub-one meter terminals. We test a large number of X-band terminals, and consistently achieve great results like this. XTAR is ready to test newly developed terminals, and to serve those mission-critical communications needs for size, weight and power-limited (SWaP-limited) users who simply must have the most reliable communications.